Graphene memory arrays in three dimensions may be possible, according to research performed at Rice University. It turns out that a tiny jolt of electricity can 'break' a strip of graphene just ten atoms thick; another jolt restores it to normal. This kind of graphene 'switch' could revolutionize data storage, making it possible to store more data in less space with less energy. Graphene memory arrays could increase the quantity of storage in a two-dimensional array by a factor of five. Individual bits would be smaller than 10 nanometers, much smaller than the ponderous 45-nanometer circuitry in use in flash memory today. Also, the new switches could be controlled by two terminals instead of three. Two switches is a key advance; this makes three-dimensional memory practical. Also, a graphene memory bit is essentially a mechanical device; it would consume virtually no power while keeping data intact. And, in the It Just Keeps Getting Better And Better department, Tour says that graphene 'switches' are significantly faster in operation, have a longer operating lifetime, and work well from minus 75 degrees to more than 200 degrees Celcius. 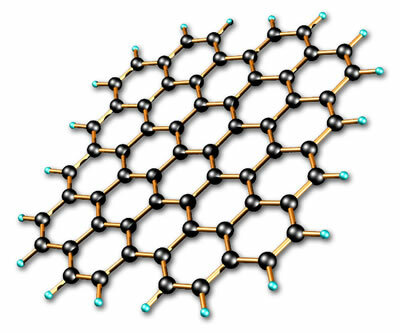 From James Tour’s graphene device may make massive storage practical.